This study reports on the success of the Marhaba! curriculum using quantitative research procedures. Visit www.cheng-tsui.com for details. A multi-disciplinary team of researchers and teachers gathered materials appropriate to high school students to create lessons based on the National Standards for Foreign Language Education. The team drafted and reviewed lesson plans and supplementary materials, and mapped the progress of student language acquisition based on the lessons. The result: a curriculum that will graduate students at oral and written proficiency levels equivalent to a semester of college-level study. 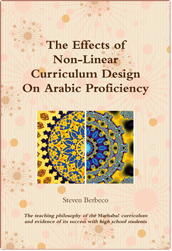 To ensure that the curriculum is well suited to students in a variety of settings, Marhaba! was distributed and tested in multiple settings varied by geography, student demographics, and school size. The schools provided the applied skill opportunities (multiple learning modality activities) as recommended by the curriculum. Teachers field-testing the program materials gathered feedback throughout the pilot year in student journals, teacher reflections, and other structured mechanisms. The findings informed the development of the final product. The final product was distributed cost-free to high school programs with additional materials posted online. High school programs had access to professional development offerings by the project team, including major training events such as a two-day orientation to the curriculum and a mid-year retreat for technical assistance. The first level of the Marhaba! curriculum, including a training DVD and sample student work, is now available for purchase from Cheng & Tsui. The second level of Marhaba! will be published soon. For details, go to cheng-tsui.com. We will continue to develop targeted, relevant, costefficient, and highly successful professional development as part of the project’s scope and objectives, including national curriculum institutes where we will discuss implementation, limitations, and directions for future work for the project’s curriculum; bi-weekly virtual discussion groups to support just-in-time professional development needs; an expanded selection of training videos to include other areas of curriculum use; and case method materials to assist in the practical use of the curriculum in diverse classrooms.